The ruling Progressive Party of the Maldives (PPM) has begun primaries for 25 parliamentary constituencies today. Voting is proceeding smoothly in Malé at Dharubaaruge, Thajuddeen School, Malé City Hall and the PPM’s ally Maldives Development Alliance (MDA) party offices, PPM Secretary General Mohamed Zuhair said. Over 2,700 members had registered to vote in Malé, Zuhair said, adding that the only complaints the party had received so far related to registration. Parties in the ruling coalition allocated 49 of the 85 People’s Majlis seats to the PPM, 28 seats to the Jumhooree Party (JP) and nine seats to the MDA. The party ticket was initially awarded to 13 candidates due to a lack of contestants. The 13 included eight incumbent MPs. Over 150 candidates applied to contest the remaining 36 constituencies. But only 92 candidates were chosen for the primaries. Applicants were graded on a six point criteria that included the extent to which candidates uphold party ideology, the length and type of service to the party, experience in parliament and participation in the presidential campaign. Only candidates who received over 75 points were allowed to contest. Five candidates – including four incumbent MPs – were awarded the party ticket on Friday after their competitors failed to meet the 75 percent threshold. The PPM said it will hold primaries for the remaining six constituencies tomorrow. Vilimaafannu MP Ahmed Nihan who won the party ticket by default said some members had complained of the party leadership favoring one candidate over the other. “Holding primaries is not easy. For any party. But I do not expect any major issues,” he said. Meanwhile, local media have reported conflict has emerged between the PPM and MDA over the Gahdhoo constituency. The seat was initially allocated to the MDA, but the party decided not to field a candidate and to instead back incumbent MP Zahir Adam. Zahir was recently suspended from opposition Maldivian Democratic Party (MDP) after he violated a three-line whip and voted for President Abdulla Yameen’s cabinet in December. Following MDA’s decision not to contest the Gahdhoo constituency, PPM called for applicants for primaries. According to local media, the MDA has ordered the PPM to retract the announcement. Polls will close at 10:00pm tonight. Applications must be submitted to the Elections Commission by February 11. Parliamentary elections are set for March 22. Maldivian Democratic Party (MDP) supporters took to the streets of the Sri Lankan capital Colombo yesterday to protest for early elections and the resignation of President Dr Mohamed Waheed Hassan. Gathering outside the Maldivian High Commission in Colombo, “a few dozen” anti-government protesters were said to have taken part in the demonstrations, according to newspaper Haveeru. The demonstration, which was attended by Former president Mohamed Nasheed’s Press Secretary Mohamed Zuhair, also focused on the alleged use of excessive force by Maldivian security forces in order to disperse protesters on the streets of Male’. The MDP contends February’s controversial transfer of power that brought President Waheed to power was a “coup d’etat” sponsored by mutinous sections of the police and military. According to Haveeru, yesterday’s demonstration ended peacefully at about 5:30pm. However, the gathered crowd were said to have become briefly “unruly” after President Waheed’s brother, Assad Waheed, attempted to film coverage of the protest using his camera phone before returning into the High Commission building. Parliament yesterday passed a bill to bring universal health coverage to Maldivian citizens for the first time in the nation’s history. The bill was submitted by Nolhivaram MP Mohamed ‘Colonel’ Nasheed and unanimously approved by with 72 votes. According to the bill citizens receive government-sponsored coverage up to Rf100,000 (US$6,500) per year. Zuhair said the bill includes provisions for citizens who require further financial assistance. Expatriate workers are also eligible for coverage providing their employers pay a upfront fee of Rf1,000 (US$65). The Aasandha (well-being) program was officially signed at Artificial Beach today with hundreds of Maldivian citizens in attendance. The mood was positive. Aasandha is a public-private partnership with Allied Insurance. Under the agreement, Allied will split the scheme’s shared 60-40 with the government. The actual insurance premium will be paid by the government, while claims, billing and public awareness will be handled by the private partner. Provision of the service was said to have been made available through a collaboration with London-based international banking organisation Lloyd’s and the US-based Global Assurance Group. The service will cover emergency treatment, including overseas if the treatment is not available locally, inpatient and outpatient services, domestic emergency evacuation, medicine under prescription, and diagnostic and therapeutic services. Maldivians regularly travel to Sri Lanka, India and Singapore for medical treatment, including giving birth. Allied has also claimed that its premium package now allows for coverage everywhere in the world including the US and Canada. Zuhair confirmed that the government has agreements with medical centers in these countries and can provide coverage for treatment at designated centers as well as travel stipends. Coverage for treatment abroad is limited to high-income individuals, however Zuhair understood that the some government funds would be available to needy families. The universal deal also comes with universal responsibility. Plans for such improvements are in place. One recently proposed plan would shift the pharmaceutical industry to generic drugs, which the World Health Organisation considers more affordable and reliable than brand-name products. The same plan would also streamline the prescription process, cutting back on paperwork and reducing patient stress. The new health insurance plan will become active on January 1, 2012. Zuhair said citizens can expect minimal paperwork responsibilities. Zuhair advised the public to attentively update their identification cards, as these will be necessary to receive treatment under the Aasandha plan. Parliament yesterday also passed a pre-school bill, submitted by Meedhoo MP Ahmed Siyam Mohamed and approved with 71 votes, and an archive bill submitted by Manadhoo MP Mohamed Thoriq, approved with 66 votes. Documentary film “The Island President” will make its debut in the Maldives during the week of November 21. Specifics have not yet been released. “The Island President” was screened at the prestigious Toronto International Film Festival (TIFF) in September, where it received the Cadillac People’s Choice Award for Best Documentary by audience vote. The film was one of 25 submissions in the documentary category. The documentary was also screened at the exclusive Telluride Film Festival in Colorado earlier this month, where Hollywood Reporter named “The Island President” one of the festival’s “Top 12 films to know”. The grant-funded film project began in 2009, when Oscar- and Emmy- winning American documentary company Actual Films contacted the Maldives’ newly-elected government. In an interview on Mavericks, Director Jon Shenk said the film was an evolutionary process. “It’s difficult to explain a film that involves a lot of access and high ratio shooting,” he said, describing his initial proposal to the President. In other interviews, Shenk noted that Nasheed’s candid politics and acceptance of the cameras were key to the film’s success. Starting with Nasheed’s initial vow to make the Maldives carbon-neutral, the film documents the president’s efforts to make climate change an important issue for politicians around the globe. The film culminates in Copenhagen, where world leaders met in December 2009 for the United National Climate Change Conference. Although the summit was later reviewed as a failure, it did mark the first time that leading world powers agreed that the issue needed to be addressed. “The Island President” was co-produced by AfterImage Public Media and the Independent Television Service (ITVS), in association with Actual Films and Impact Partners, with major funding provided by the Corporation for Public Broadcasting, Ford Foundation, John D. and The Catherine T. MacArthur Foundation, The Atlantic Philanthropies, and the Sundance Institute Documentary Fund. The Maldives is the film’s fifth stop on an international tour that has included TIFF, Telluride, Doc NYC and IDFA Amsterdam film festivals. After the Maldives screening it will be shown at the International Film Festival of India in Goa. State Minister for Tourism Mohamed Thoyyib previously told Minivan News that in spite of its title the documentary was not about President Mohamed Nasheed. Rather, it is about the issues facing the Maldivian people. The film raised awareness of global warming, portrayed and promoted “the unique ” Maldivian culture and language, and illustrated government transparency, he said. “No scene was created or scripted, some reviewers even noted that the film’s most unique aspect was that it shot real events on a level that had never before been achieved in the Maldives, or within other governments,” Thoyyib said. Thoyyib also noted that the Maldivian government had benefited a great deal from the film, but had not spent money on its production. President’s Office Press Secretary Mohamed Zuhair today said he didn’t believe the government was officially involved in the upcoming screening, but was optimistic about the event. Zuhair elaborated on the country’s progress by comparing use of foreign aid in previous administrations. He hoped the Maldives would be used as an example for other small countries. When asked if the screening bore relevance to the SAARC summit now taking place in Addu City, Zuhair said climate change would be a major talking point. He added that the summit is another indicator of the Maldives’ democratic growth. “SAARC shows our effort to be not just an active, but a proactive member of an international organisation,” he said. Filmmakers Shenk and Richard Berg will accompany the film to Male’. The Maldives has said it supports recent political reforms in Burma, which has freed hundreds of political prisoners over the past several weeks. The Burmese government has also begun direct talks with opposition leader Aung San Suu Kyi. “The Maldives welcomed the release of the 200 political prisoners on 11 October. We would like to see all remaining political prisoners in Burma freed,” said President’s Office Press Secretary Mohamed Zuhair. “The ongoing talks between the government and Aung San Suu Kyi have the potential to lead to meaningful democratic reforms,” he added. According to a statement issued by the President’s Office, the international community expects the Burmese government to make significant progress on issues of democracy and human rights. The Attorney General’s (AG) Office has appealed the Criminal Court’s ruling that the arrest of Gassan Maumoon was unconstitutional. The AG’s Office told local media that it appealed because the court’s ruling contained “legal issues” and was delivered in a case that the police had not filed. Gassan Maumoon, son of former president Maumoon Abdul Gayoom, was arrested on Monday, October 23 for allegedly throwing a wooden plank that struck and critically injured a 17-year-old boy during a protest outside of the family’s household, Endherimaage. The protest was held by the ruling Maldivian Democratic Party (MDP) on October 20. Gassan was subsequently summoned twice by police, and later taken to Dhoonidhoo prison for further enquiry. The Criminal Court however released Gassan under the claim that his arrest violated procedures established by the Supreme Court for operating article 46 of the constitution. The ruling came after Gassan’s lawyers applied for a writ of ‘habeas corpus’, or release from unlawful detention. They argued that due process was violated as the circumstances of his arrest did not fall under exceptions provided for in the constitution where police could arrest suspects without an arrest warrant. President’s Office Press Secretary Mohamed Zuhair added that the court had cited a precedent set by the Supreme Court on a similar case, stating that a suspect should be arrested at the scene of the crime. Otherwise, said Zuhair, a suspect should be arrested at the scene where evidence is found. Zuhair observed that the court’s policy on article 46 restricts the due course of justice. “The police had investigated the case and detained Gassan when they thought they had enough evidence. They submitted the evidence to the court and followed the procedures in place. What other procedures should they use, especially in a time-sensitive case such as a case of violence?” he said. Zuhair added that if the court’s claim against the police’s arrest procedures went undisputed, all individuals arrested during the protest would have to be released. Police Superintendent Mohamed Jinah insisted at the time of the court’s ruling that the arrest was lawful as police had reasonable grounds to suspect Gassan had committed a crime and were prepared to submit early evidence. On October 26, police released 11 suspects who had been arrested without a warrant on suspicion of having committed an offence. When asked if the appeal was expected to overturn the court’s ruling against the police. Zuhair was optimistic. Gassan’s case involves another first: after the police were allegedly summoned to and “thrown out” of the Prosecutor General’s (PG) office, the PG publicly stated that it was seeking legal advice from the Supreme Court. “This is unprecedented, usually these cases are appealed to the High Court,” Zuhair said. “I hope this is resolved quickly because there is a growing concern among a wide section of society over the impartiality of the judiciary,” he concluded. The request was made in relation to a Supreme Court case in which Gassan has contested MP Mohamed Musthafa’s election to parliament in May 2009. “The Supreme Court case is the latest installment of an ongoing attempt by Gayoom to secure a parliamentary seat for his son, Gassan Maumoon,” a statement sent by MDP and subsequently forwarded to diplomatic missions and United Nations offices by the Foreign Ministry alleged. Recent actions in the judicial system have indicated a deep and tangled history of politically biased judicial rulings. The Judicial Services Commission (JSC), the watchdog body charged with overseeing the judiciary, abolished its Complaints Committee citing “efficiency”, with complaints against judges subsequently forwarded for review by the legal section and Chair Adam Mohamed Abdulla, a Supreme Court Justice. Chair of the former complaints commission, Aishath Velezinee, was meanwhile stabbed in the street in January this year. The JSC also failed to table or even acknowledge receipt of a report on the judiciary produced by the International Commission of Jurists (ICJ), which questioned whether the JSC possessed the technical ability and knowledge to investigate complaints and hold the judiciary accountable, as well as its independence. In the wake of these developments, Zuhair said lawyers have begun forums to openly discuss allegations against the judicial system. “They are active and getting a fair amount of media coverage, I think they may formulate reforms for two laws concerning judges and the judiciary,” he said. The laws involve the process of appointing judges to the Supreme Court, and the qualifications required of a Supreme Court judge. Sri Lanka will provide security from its Special Task Force (STF) units for the South Asian Association for Regional Cooperation (SAARC) summit to be held in Addu City this November. STF is an elite special forces unit of the Sri Lankan police which was formed in 1983, and focuses on counter-terrorism and counter-insurgency operations. It was the lead unit engaged with the Tamil Tigers during the Sri Lankan civil war. The Foreign Ministry and the Maldives National Defense Force (MNDF) confirmed today that STF will be sending police dogs to support unidentified security matters. “Previously, security dogs were allowed at the international airport, I’m not sure if they are still there but Maldivian law allows dogs to be used for security measures,” said MNDF Spokesperson Abdul Raheem. “The dogs will clear the same areas as the event and other security forces, but I can’t say what they will be looking for,” he added. Dogs are considered haram in Islam, and are prohibited as domestic pets in the Maldives. An exception was made for drug-sniffing and security dogs at Ibrahim Nasir International Airport, however sources familiar with the issue say local staff were unable to provide proper care for the dogs and they fell ill. Allegations of religious intervention were denied. President’s Office Press Secretary Mohamed Zuhair told Minivan News that the STF dogs would not be an issue for the SAARC event. “We had dogs earlier for security without any trouble, I don’t see why anybody should object because the government has officially employed dogs before,” he said. All countries participating in the SAARC convention are providing security forces. According to Zuhair, Bangladesh has donated trucks to the army, India is contributing police forces, and equipment with an estimated value of US$400,000 will be arriving from Pakistan in the next few days. China will provide CCTV equipment for surveillance. 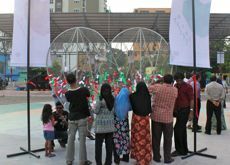 “It’s a well-integrated and cooperative effort with MNDF and all participating members,” said Zuhair, who pointed out that Addu was a unique site for an event of this magnitude. “The last SAARC was held in Male’, but this time the event will be spread across several islands. Transportation logistics will be different,” said Zuhair. Heads of state from the region will be attending SAARC, several of which are currently high-profile figures in the international community. “We have to look at this as a high-risk event. Some heads of state are high-risk, but we are treating each and every head of state as high-risk to ensure their security,” said Raheem. Local media reports that STF forces have been having special training programs in the Sri Lankan capital Colombo to prepare for the Addu event. The previous version of this article stated that Pakistan would provide US$4,600-worth of equipment to the SAARC summit security measures. In recent days, Libya’s six-month long revolution against dictator Muammar Gaddafi came to a close when NTC rebels seized Tripoli. Currently, Qaddafi’s whereabouts are unknown and over thirty foreign powers have recognised the NTC as Libya’s legitimate representative group. President Nasheed noted in his letter to NTC chief Jalil that the Maldives was among the first three countries to recognize the NTC. Iraq, Morocco, the US and European Union member countries have also recognised the group, while Russia and China do not recognise the NTC as Libya’s only legitimate representative but are still engaging in talks with NTC leaders. Ethiopia and Nigeria have called on African Union member states to recognise the NTC, and Hamas had declared its support of the rebel group. Zuhair said the Maldives was one of the first Islamic countries to experience a democratic revolution. In 2005, the Maldivian people began the uprising that ousted former President Maumoon Abdul Gayoom in 2008. The Maldives, which has been a Muslim state for over 900 years, has one of the longest traditions of shariah law in the Arab world, said Zuhair. He said the Maldives encourages the Libyan NTC to apply democratic norms and values, and to use many small elections as they build a modern Muslim democracy. “The Maldives would like to see Libya become a modern Islamic democratic state that is fully functional,” said Zuhair. Earlier this week, the NTC reportedly placed a US$2 million bounty on Gaddafi’s head.